The Graduate is a 1967 American romantic comedy-drama film directed by Mike Nichols and written by Buck Henry and Calder Willingham, based on the 1963 novel of the same name by Charles Webb, who wrote it shortly after graduating from Williams College. A bildungsroman that follows its protagonist's transition into adulthood, the film tells the story of 21-year-old Benjamin Braddock (Dustin Hoffman), a recent college graduate with no well-defined aim in life, who is seduced by an older woman, Mrs. Robinson (Anne Bancroft), and then falls in love with her daughter Elaine (Katharine Ross). The film was released on December 22, 1967, received positive reviews and grossed $104.9 million in the U.S. and Canada. With the figures adjusted for inflation, the film's gross is $}}, making it the 22nd highest-ever grossing film in the U.S. and Canada. In 1996, The Graduate was selected for preservation in the U.S. National Film Registry as being "culturally, historically, or aesthetically significant." Initially, the film was placed at number 7 on AFI's 100 Years... 100 Movies list in 1998. When AFI revised the list in 2007, the film was moved to number 17. 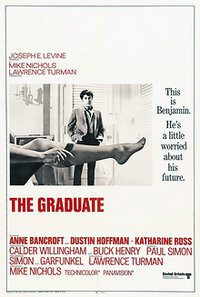 The Graduate won the Academy Award for Best Director for Nichols and was nominated in six other categories, making it the last film so far to win Best Director and nothing else. This webpage uses material from the Wikipedia article "The_Graduate" and is licensed under the GNU Free Documentation License. Reality TV World is not responsible for any errors or omissions the Wikipedia article may contain.